Anorexia is an eating disorder that causes people lose more weight than is considered healthy for their age and height. People with this disorder may have an intense fear of weight gain, even when they are underweight. They may diet or exercise too much or use other ways to lose weight. The exact causes of anorexia are not known. Many factors may be involved. Genes and hormones may play a role. Social attitudes that promote very thin body types may also be involved. Anorexia often begins during the pre-teen or teen years or young adulthood. It is more common in females, but may also be seen in males. Has an intense fear of gaining weight or becoming fat, even when underweight. Refuses to keep weight at what is considered normal for their age and height (15% or more below the normal weight). Has a body image that is very distorted, be very focused on body weight or shape, and refuse to admit the danger of weight loss. The biggest challenge in treating anorexia nervosa is helping the person recognize that they have an illness. Most people with anorexia deny that they have an eating disorder. They often seek treatment only when their condition is serious. Goals of treatment are to restore normal body weight and eating habits. A weight gain of 1 to 3 pounds (lb) or 0.5 to 1.5 kilograms (kg) per week is considered a safe goal. To start, a short hospital stay may be recommended. This is followed by a day treatment program. The person has lost a lot of weight (being below 70% of their ideal body weight for their age and height). For severe and life-threatening malnutrition, the person may need to be fed through a vein or stomach tube. Treatment is often very difficult. People and their families must work hard. Many therapies may be tried until the disorder is under control. People may drop out of programs if they have unrealistic hopes of being "cured" with therapy alone. Cognitive behavioral therapy (a type of talk therapy), group therapy, and family therapy have all been successful. Goal of therapy is to change person's thoughts or behavior to encourage them to eat in a healthier way. This kind of therapy is more useful for treating younger people who have not had anorexia for a long time. If the person is young, therapy may involve the whole family. The family is seen as a part of the solution, instead of the cause of the eating disorder. Support groups may also be a part of treatment. In support groups, patients and families meet and share what they have been through. Medicines such as antidepressants, antipsychotics, and mood stabilizers may help some people when given as part of a complete treatment program. These medicines can help treat depression or anxiety. Although medicines may help, none has been proven to decrease the desire to lose weight. Anorexia is a serious condition that can be life threatening. Treatment programs can help people with the condition return to a normal weight. But it is common for the disease to return. Women who develop this eating disorder at an early age have a better chance of recovering completely. Most people with anorexia will continue to prefer a lower body weight and be very focused on food and calories. Weight management may be hard. Long-term treatment may be needed to stay at a healthy weight. Getting medical help right away can make an eating disorder less severe. American Psychiatric Association. Feeding and eating disorders. In: American Psychiatric Association. Diagnostic and Statistical Manual of Mental Disorders. 5th ed. Arlington, VA: American Psychiatric Publishing. 2013;329-345. Lock J, La Via MC; American Academy of Child and Adolescent Psychiatry (AACAP) Committee on Quality Issues (CQI). Practice parameter for the assessment and treatment of children and adolescents with eating disorders. J Am Acad Child Adolesc Psychiatry. 2015;54(5):412-425. PMID 25901778 www.ncbi.nlm.nih.gov/pubmed/25901778. Tanofsky-Kraff M. Eating disorders. In: Goldman L, Schafer AI, eds. Goldman-Cecil Medicine. 25th ed. Philadelphia, PA: Elsevier Saunders; 2016:chap 219. 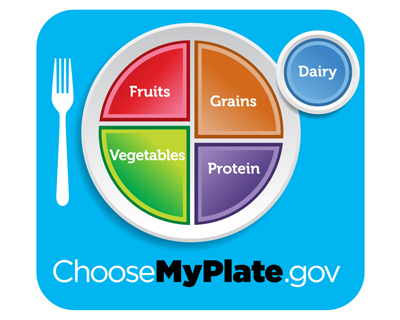 The U.S. Department of Agriculture's newest food guide, called MyPlate, encourages consumers to make healthier food choices. The guide encourages you to make healthy choices and avoid oversized portions. Half your plate should be filled with fruits and vegetables. At least half of your grains should be whole grains. You also should switch to fat-free or low-fat milk.